Sweden’s Social Democratic Prime Minister Stefan Löfven has probably never stood so alone: roasted by the right for leaving the door wide open to asylum-seekers and lambasted by the left for later slamming it shut. Either way, like German Chancellor Angela Merkel he has faced some hard decisions on immigration and lost support in his own camp since shutting Sweden’s borders at the end of 2015, after taking more than 240,000 asylum-seekers since 2014. At 61, Löfven, a former metal worker and union leader, faces the biggest challenge of his career: to keep one of Europe’s last centre-left governments in power. Sweden’s ruling Social Democrats launched their election manifesto on Tuesday (28 August) promising an extra week of holiday for parents as the party seeks to avoid its worst showing ever in a national vote. As the son of a poor single mother who came into politics after rising through the ranks of the trade union movement, he can truthfully claim to understand the challenges faced by “ordinary” voters. Born in Stockholm in 1957, poverty forced his mother to give him up when he was 10-months-old to a foster family in Solleftea, 500 kilometres (310 miles) north of the capital, where the father was a factory worker. He became a welder and spent 15 years working in a defence factory, joining the union in the early 1980s and ending up as head of the metal workers’ union Metall from 2006 to 2012. “I’m sometimes described as a right-wing socialist because I think industry is important. I find that very bizarre,” retorts the politician with the square build and nose of a boxer to those who accuse him of turning his back on the party’s base. 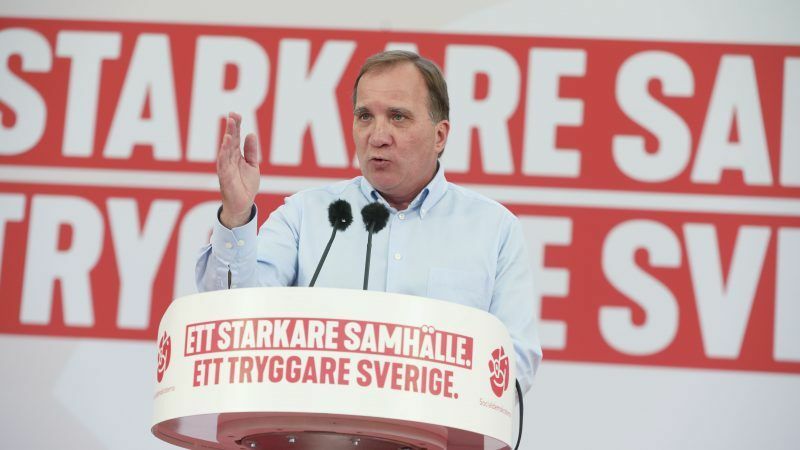 Ahead of Sweden’s 9 September legislative elections, he has tried to court everyone from the left to the centre, one eye firmly on the thorny negotiations likely to lie ahead to form a government. His Social Democrats, which have dominated Swedish politics since the 1930s, are leading in the polls, but they look set to post a record low score, just ahead of the far-right Sweden Democrats (ECR-affiliated) and conservative Moderates (EPP), who are battling for second place. 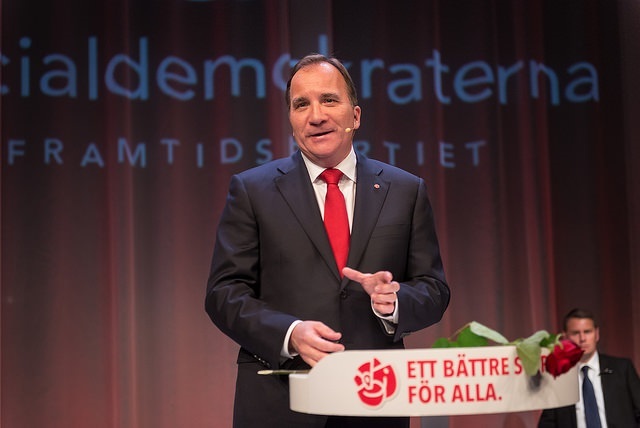 Despite some internal dissension, “Stefan Löfven has managed to keep the party united, his leadership isn’t questioned”, Ulf Bjereld, a University of Gothenburg political science professor and a member of the Social Democrats’ executive committee, told AFP. After allowing large numbers of asylum-seekers into the country after 20014, Löfven announced on 24 November 2015 that Sweden was aligning its asylum policy with the European Union’s minimal levels, cracking down on family reunifications among other things. A surge in the number of refugees arriving in Sweden over the past few years has led the conservative Moderates, the country’s biggest opposition party, to toughen its stance on immigration. “It pains me to say that Sweden can no longer take in asylum-seekers at the same high level… Sweden needs some breathing room,” Löfven told a news conference, his Greens Party deputy prime minister Asa Romson at his side, tears streaming down her cheeks. “Even Angela Merkel in Germany had to do a U-turn on immigration. But no leader in Europe did as brutal an about-face as Stefan Löfven,” wrote Sweden’s paper of reference Dagens Nyheter in May. 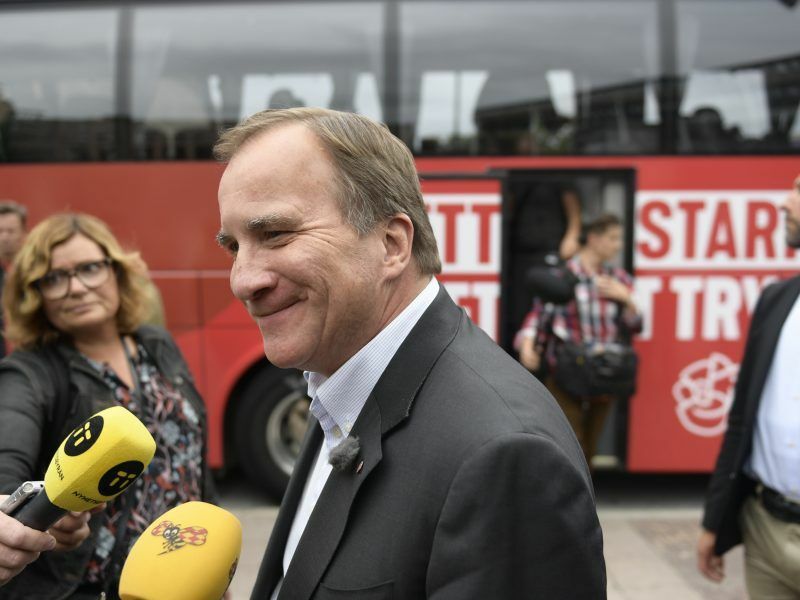 Löfven’s detractors say his stance on immigration and integration is “naive” and “irresponsible”. To counter that he has taken a hard line, repeatedly stressing that new arrivals in Sweden have both “rights and responsibilities”. And with cars being torched and gangs settling scores in Sweden’s disadvantaged suburbs, he regularly calls for “law and order” — a phrase more commonly used by the right-wing. Seen by some as a poor orator who lacks charisma, he is nevertheless popular with many Swedes who see him as “genuine”. A recent Skop poll showed a majority of Swedes would rather break bread with him than with his Swedish Moderate Party challenger Ulf Kristersson. He and his wife Ulla — who lead the sort of simple, modest lifestyle seen as a virtue in Sweden — were recently featured in the pages of a celebrity magazine, and on television, an unusual move for Social Democratic politicians. If elected to a second term, Löfven is likely to have to contend with a downturn in the domestic and international economy, as forecast by experts after Sweden’s long period of growth.